The Basement Doctor of Cincinnati is The Basement Contractor To Call! The Basement Doctor of Cincinnati proudly serves the cities of Fairfield, Mason, West Chester, Hamilton and many neighboring areas, including Fairfield, Loveland, Middletown, New Albany, West Chester, Jeffersonville, Fairborn. Click to view our full-service area. Having been fixing basements and crawl spaces since we opened and having a time-tested and patented line of quality products, we are the local, expert contractors to call. 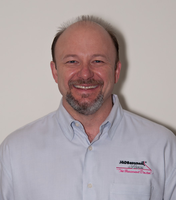 Bobby Miles is the owner of The Basement Doctor of Cincinnati, a basement waterproofing company with an office in Cincinnati, OH. As part of the Basement Systems network of dealers, The Basement Doctor of Cincinnati has exclusive access to more than 30 patented products which allow them to custom design an effective and permanent solution for every type of wet basement problem. "We are here to help our customers," says Bobby. "It is very gratifying to me knowing that we can go in somebody's basement that had 6 to 10 inches of water in it, waterproof it with our patented systems through the network, and know that they will have a dry basement for life." If you live in our service area, you can sit and talk about your Free Estimate with one of our expert basement technicians. They can answer any question you may have concerning your sub-floor water problems. Our 88-Page Waterproofing Book: Prior to the meeting, you will receive a copy of our informative, 88-page crawl space and basement waterproofing book. A Home Evaluation: Your waterproofing expert will thoroughly inspect your subfloor area and go over the findings with you, point by point, answering all questions you may have. Your Complete Basement System Design: Taking precise and accurate measurements, our basement professional will sit down with you and design your waterproofing system according to the space, our products, your budget and your ideas. A FREE Written Quote: Then we can provide you with a free, no-obligation written quote. We have a set price list so there are no surprise costs or heavy-handed sales techniques. We can and will help you build a better, dryer, more comfortable basement! Our knowledge and experience and fine quality products can give you the ease you need to live with a better, healthier basement. We'd like to show you how we can help you waterproof your basement or control moisture in your crawl space. We have the experience, equipment, and best practices you need to ensure a dry basement and peace of mind. Contact us today for a free waterproofing quote!